Creflo Dollar, founder and pastor of World Changers Church International, is back in the spotlight. People are questioning who Dollar supports for President, and one website says Dollar backs Trump. 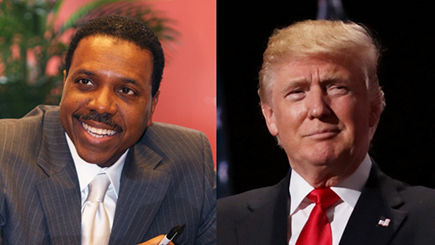 CentricTV.com reports Creflo Dollar declared that God told him to endorse Donald Trump for President of the United States. Creflo Dollar immediately denied the story, saying in a statement, "Any reports stating that I have endorsed Donald Trump for President are false. I have not endorsed any candidate and do not plan to. This rumor originated on a satirical website and is 100% untrue." Public records (pictured below), however, show that Creflo Dollar did vote in Georgia's Republican presidential primary this year. 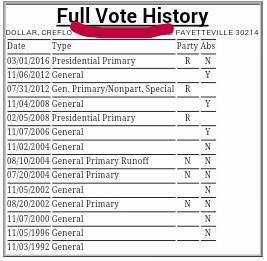 Dollar also voted in the 2008 GOP presidential primary. Dollar lives on a sprawling estate in Fayetteville, Georgia. Fayetteville is located about thirty minutes south of Atlanta in Fayette County. World Changers Church International was founded by Creflo Dollar in 1986. World Changers once boasted a 35,000-member congregation. Church services are held in a 8,500-seat chapel called the World Dome. World Changers Church International is based in College Park. College Park is a majority black community located near Atlanta's airport. Most elected officials in College Park are Democrats, and the area usually votes overwhelmingly Democratic in presidential and gubernatorial elections.